If you are having your room or your entire house renovated, one of the things you have to address is how to dispose of the resulting rubble. Let us help you clean the mess, call Jux2 Dumpster Rental. We allow you to easily and conveniently get rid of your broken appliances, yard waste, dirty carpets, construction and renovation waste materials, old furniture, and anything else you don’t need in Newark, NJ area. Don’t worry where and how to dispose them. So, why not make your roll off rental experience easy and just hire us to save yourself the hassle, time and not to mention the most important part: The Money! If left outside your property, the neighbors would complain. 10 yard roll off dumpsters hold approximately 4 pick-up trucks of debris. They’re often used on projects like small bathroom or kitchen remodels, garage or basement cleanouts, small roof replacements up to 1500 sq ft or a small deck removal up to 500 sq ft.
At Jux2 Dumpster Rental, we provide our customers the best customized solution on garbage disposal. We offer just the right size of dumpster and the exact service you need without hurting your pocket. It is very important to select the correct weight limit since additional charges are added to the overall rental charges. Our dumpsters come in various sizes’from 10 cubic yards up to 40 cubic yards. In general, aside from the obvious volume of trash, the right size of dumpster is determined by the type of materials that will be dumped into the container. The following is some additional info to help you decide on the right dumpsters to rent. Here are some more tips on how to choose the right dumpster to rent. Our smallest dumpster is good enough to dispose of the mess resulting from the cleaning out of a room, a small garage or basement. This dumpster can carry scrap materials from a small remodeling project. These small dumpsters are ideal for some residential debris removal projects; for example, a small home cleanouts or DIY home improvement projects. Our medium-sized dumpster, the 20 cubic yard type, can hold throw-away items from clean-ups of larger basements, garages, and attics. They are for major home cleanouts or for medium sized renovation projects. 30-yard dumpsters accommodate medium to large projects and 40-yard dumpsters accommodate very large projects and can handle anything thrown at them. Interesting enough, our 30 and 40-yard dumpsters are noticeably larger than those of our competitors. 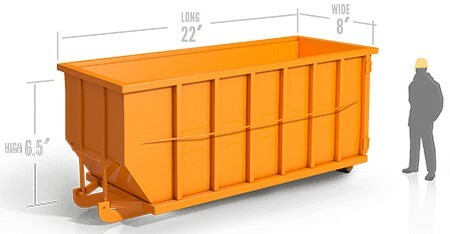 Call us today at 732-218-9098 so we can assist you in determining the dumpster size good enough for your project. When searching for the best roll off rental in Hillsborough you should take note that the cost of roll off rentals does not only depend on the size of the container. The weight of the materials you’re disposing of will also affect dumpster pricing. Picking the appropriate dumpster size not only defines the price figure of these services, but it also defines how efficiently you can get rid of the waste from your home. We urge all our customers to invest some time into gathering the information that we’ll require to provide a price quote. If you have hired the services of a contractor for your home project, he should be able to estimate the volume of rubble the project would generate and determine the right size of dumpster needed to dispose of the debris. Hurry up! Reach us for the right priced and right sized dumpster. Paying rental fees, you also have to consider county or city landfill fees as well as permits into the total price figure. It would be wise to give our dumpster professionals here at Jux2 Dumpster Rental a call at 732-218-9098 today to learn more about dumpster costs. Getting rid of large garbage piles is not a simple matter where you deal with just one service provider and pay a standard amount for a specific service rendered. By using our roll off rental, you may have to contact the concerned local authority to see if you need to pay for permits and county or city landfill fees. Call 732-218-9098 to know more about dumpster pricing and how to deal with concerned authorities. if you already know of roll off rental service to get from Jux2 Dumpster Rental. Under normal circumstances, local authorities won’t require you any more to secure a permit if the dumpster will be parked on your own property. So if you want to save yourself from the hassle of contacting the county office and securing a permit, you can just let us park the dumpster in your driveway or front lawn. Some local authorities require you to apply for a permit before you rent a dumpster unit. An important thing fact to remember is that in most areas a permit is needed if a dumpster is placed on the street. If you’re looking for the most dependable dumpster service provider in Hillsborough, give Jux2 Dumpster Rental a call at 732-218-9098. We can provide you with the roll off rentals that will handle any big or small project.